I have just been sent this letter by a trusted comrade that dates back to 2011 and the fight to save the Independent Living Fund from closure. To see this letter on it’s original web page, please click here. Not only does this letter prove the depth of struggle that disabled people have been facing since the coalition Government came into place but it also entered my inbox on a fateful day that will soon see a new First Minister being unveiled in Cardiff. I am really hoping that my preferred candidate is successful and that I can work with them over the coming months to #SaveWILG. Something needs to happen so I don’t have to experience nights like last night when I woke up at 02.30 in the morning and found myself without access to my bed remote to use the profiling feature that allows me to sit up straight and use the urinal. Without going into too much detail, an accident occurred and I had no one else to call but my 68-year-old Father who is not able to assist me in the way that he could a few years ago. The solution is obvious to you and me. I will carry on fighting for justice – for myself and all other disabled people with high support needs across Wales whoever is are new First Minister. It is only a few short days since I last wrote to you, as Minister for Disabled People, urging you to recall the Public Consultation on Disability Living Allowance (DLA) reform. 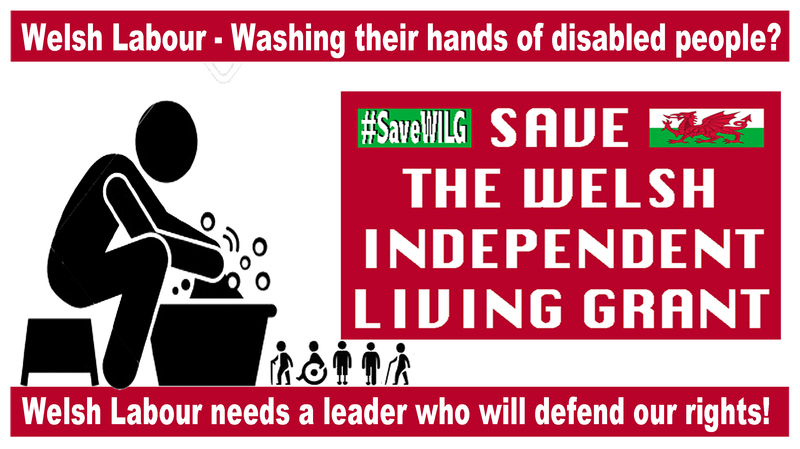 I find myself writing again with regards to the Independent Living Fund (ILF), which appears to be the Coalition Government’s latest target in its war on disabled people. You released a statement yesterday which announced that ILF would cease to exist in 2015. Many in the disabled community saw this coming, after the Fund was frozen to new applications for this year, but had hoped that you would see reason. Your statement is difficult to criticize fully because there is so little information on your plans except for vague promises of consultation in 2011. This lack of clarity has sent ILF claimants, their carers and their friends into panic. How is it possible for us to correspond with you when you fail to clarify your intentions? In the statement you claim that “the model of the ILF as an independent discretionary trust delivering social care is financially unsustainable.” There appears to be no justification of this claim. The purpose of the ILF was to maintain and allow for people with high care needs to remain living independently in the community rather than the alternative of residential care. Given the expense of residential care, surely making it possible for 21,000 people to live independently is financially sustainable and eminently sensible. The statement suggests that you will move “existing users of the ILF in to a social care system based on the principles of personalised budgets.” This means that the financial burden of care for those supported by the ILF will be foisted upon local authorities, who will set their own eligibility criteria and perform their own assessments of care needs. Levels of care provided will then decrease dramatically for those formerly supported by the ILF, and for those who would have applied for ILF in the past. This will mean that many will no longer be able to live independently and have to enter residential care, at far greater cost to the state. For others it will mean that living independently is no longer possible, with the families of these people having to meet their care needs. The Ministerial Statement is difficult to critique further because of the lack of detail. It is fair that you should issue an immediate statement providing this detail. I also demand to see the DWP’s reasoning for the claim that ILF is “financially unsustainable”, and all documentation on which this claim was based. It appears that the Coalition Government have decided to make these changes without knowing what system will replace ILF, thus making decisions which affect 21,000 lives without due care and proper planning. I wish to receive an answer that confirms or denies this. If you confirm that ILF was shut down without firm plans for the future, I suggest that you issue a personal statement apologizing to the ILF caseload for causing doubt and panic amongst them. If you deny that no plans were made, I demand a copy of this documentation be published on the DWP website. I am sure that DWP have completed an Impact Assessment an an Equality Impact Assessment with regards to this decision, and I request that both are made available to the public. I expect a prompt and detailed reply. A copy is being sent to the Secretary of State and to my constituency MP, Hywel Williams.